Dr Lee leads SABEL initiatives through Charles Darwin University in northern Australia, in particular workplace and cattle monitoring. previously he was based with QSTC partner, Prof Ohgi, at Keio University Japan. The visit to Japan came about through winning a Research Fellowship funded by The Japan Society for the Promotion of Science. These Fellowships are highly regarded within the international scientific research community. The aim of the Fellowship is multifaceted. Primarily, for collaborative research between Japanese and international institutes, with an objective of building long-term research and commercial relationships. Secondary aims include: gaining experience and proficiency in the Japanese language; and gain an understanding and appreciation of Japanese culture. His research while in Japan includes performance assessment of anatomical and prosthetic limbs of amputee athletes. Additionally, he is monitoring progression through rehabilitation of recent amputee patients. The aim is to assist in providing information that will ultimately benefit amputees in regards to their motion. Additionally, feedback to prosthetic manufacturers will assist in design improvements of prosthetics. He has also investigated micro sensor performance against an infrared 3D camera system capable of data capture both in and out of the water simultaneously. This system is unique and only recently installed at the Japan Institute of Sport Science. In late 2011, Dr Lee won the inaugural ICT Geelong, CSIRO-AIS Prize for Best Sports Technology at the “Technology Entrepreneurship Forum” invention competition. The main criterion was to present technology that would assist in aiding Australian Athlete success in the 2012 London Olympic and Paralympic Games. The work put forward was part of a greater research focus. 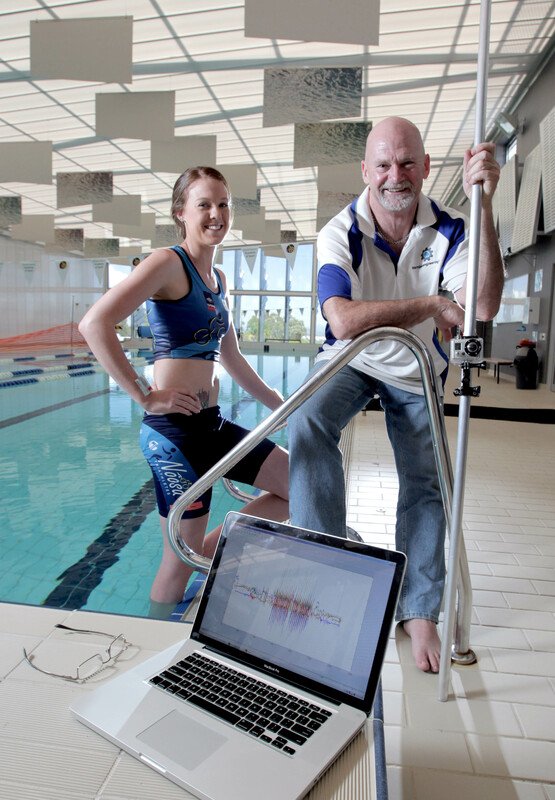 The submission was aimed at assisting swimming performance analysis using newly developed micro sensor technology. Dr Lee’s PhD research was to develop a simple method of gait assessment by using a single inertial sensor to measure kinematics during walking. Therefore longitudinal capture of gait data is possible. Athletes tested include triathletes and race walkers. Stride, step and stance durations were detected from the triathlete data. The ability to identify symmetry/asymmetry in running was also shown to be possible using a single sensor. Race walking has controversial exposure in regards to judging and the ability to detect illegal step, mainly flight or loss of ground contact. The sensors were shown to be able to detect illegal steps more accurately and consistently than the naked eye. The image just above is of Jim and his Triathlete daughter, Tobie Evens-Lee. It was taken as part of a photo shoot and story by The Courier Mail. His interest in sports science developed from a diverse competitive sporting background including coaching rowing, soccer, and swimming. Jim was a former rower, AFL (Australian football) player – (a proud Richmond tragic), and observed section motorcycle trials competitor. A swimming official, along with various positions held within sporting club committees. He currently enjoys a love mountain running and is hoping to climb Mount Fuji while in Japan. The other item on Jim’s Japanese “bucket list” is to run a marathon and has entered the 7th Shonan International Marathon being held on 3 November 2012.